With the Major League Baseball season now at the midway point, it's time for the second installment of our 2013 power rankings. Latin players took the first half by storm. Miguel Cabrera was, well, Miguel Cabrera. Yasiel Puig showed huge potential in his first month at the big league level. Manny Machado seemed to find himself at second base after virtually every at-bat. Yadier Molina repeatedly showed us why he is the best catcher in the game, and possibly the best player at any position. Lastly, Yoenis Cespedes channeled his inner Sammy Sosa in winning the Home Run Derby at Citi Field. Will these guys have the same type of impact during the second half of the year? Hard to say. As these rankings show, a lot can change over a fairly short period of time. The numbers in parenthesis designate where the teams ranked in our quarter-season rankings back in May. 1. Oakland Athletics (16) - The Athletics are keeping the Rangers and Angels at bay with names like Donaldson, Lowrie, Crisp, Cespedes, Balfour and Colon. Josh Donaldson put up All-Star worthy stats, but was left off the roster; 61 RBI, 51 runs and 16 home runs. The casual fan learned who Cespedes is watching him hit towering homers at the derby. The pitching has been nothing short of amazing, led by 40-year-old Bartolo Colon. He is coming off a start where he shutout the Angels in Anaheim. This team is built for success with gritty, unselfish, no nonsense players that want to do nothing but win. Billy Beane has put it all together once again. 2. Boston Red Sox (9) - 15 blown saves for the Sox this season, and 3 different guys have been used at closer. This is the only reason Boston is No. 2. They have everything else; including a candidate for Manager of the Year in John Farrell. He has successfully cleaned up Bobby Valentine's mess from last season in virtually no time at all. David Ortiz came off the DL and destroyed pitching right out of the gate. In 81 games this season, the designated hitter has 97 hits, including 24 doubles, 2 triples and 19 home runs. He's also batting .321, with 65 runs batted in. MVP-type numbers, if not for Miguel Cabrera and Chris Davis. Despite only a .500 record, John Lackey looks as good as he ever has, and once Clay Buchholz returns from the disabled list, this team will be even more formidable. 3. St. Louis Cardinals (1) - Major League Baseball's greatest baseball city is talking right now. They are talking about the chances of winning a 12th World Series championship. Yadier Molina is putting together an MVP season behind the dish. They have 3 players in the top 5 in hitting, with Molina, Carpenter, and Craig all up there. The pitching, although still 4th in team ERA, has fallen off a bit. Lance Lynn and Shelby Miller are not producing as they were earlier in the season. If Lynn can get back to form, the Cardinals have a legitimate shot at winning it all. 4. Detroit Tigers (12) - While Justin Verlander is trying to get back to form, the offense is having no problems whatsoever. Reigning AL MVP Miguel Cabrera leads all of baseball with a .358 average, and is second to only Chris Davis in both home runs (31) and RBI (96). The question is; why is this team only leading the Indians by 3.5 games? Once they get clicking on all cylinders, they'll run away with the division. 5. Pittsburgh Pirates (11) - The 20-year streak of losing seasons will be coming to an end soon. The Bucs will make the playoffs, likely as a wild card team. This is going to be a good club for years to come. They have a lot of talented young players in McCutchen, Alvarez, Marte, Walker, Locke and Cole, and many others waiting in the minors. The Pirates lead the league in pitching, and currently sit in second place in the NL Central. That division, coupled with the AL East, is going to be fun to watch down the stretch. 6. Tampa Bay Rays (14) - Joe Maddon is the best manager in Major League Baseball. If you don't agree, you obviously don't know baseball at all. He uses the players he gets, and gets the most out of them. It does help that his minor league system is stockpiled with arms, though. David Price is back to his old self. Evan Longoria is putting together another great year. They are 16-3 in the month of July, but most of it was against sub .500 clubs. Playing in the tough AL East may hinder them, but I still see a wild card spot in their future. 7. Atlanta Braves (7) - What was supposed to be the best outfield in baseball hasn't played like it. Justin Upton has held up his end of the bargain, but brother B.J. hasn't. Still waiting for him to break through, and hopefully a healthy Jason Heyward will help. Atlanta seems to be a balanced team offensively, with All-Star Freddie Freeman leading the way, hitting .311 through 85 games played. He also leads the team in RBI with 64. With injuries starting to pile up, the break came at the right time for Atlanta. Moving forward, it's not the Nationals that would scare me if I'm the Braves. It's the Phillies. 8. Texas Rangers (2) - Going up against Oakland is proving to be a tough task. The Rangers continue to move along this season, due in part to Adrian Beltre leading the way with a .312 average and 56 runs scored. Nelson Cruz leads Texas in the power stats with 23 homers and 70 runs batted in. No Josh Hamilton, no problem, as they continue their winning ways. 9. Cincinnati Reds (6) - Brandon Phillips has 79 RBI in his new found spot in the lineup, and Joey Votto and Jay Bruce continue to put up nice numbers. The pitching is leading the league in WHIP with a 1.18 mark. The problem is, they play in one of the toughest divisions in baseball. Dusty Baker has them playing good ball, but right now, good isn't good enough. 10. Cleveland Indians (4) - Our last rankings had the Tribe way higher, as they were blistering hot at the time. Now they are hot again, and Jason Kipnis is playing out of his mind. Terry Francona may have caused them some late inning losses with his handling of the bullpen. Cleveland will make a move for a bat, and if anyone wants Mark Reynolds, they should just throw him in for free. The guy strikes out more than Raj from Big Bang Theory. 11. Baltimore Orioles (10) - The O's rank 27th overall in pitching, with a 4.33 team ERA. That's not going to cut it if they want to make the playoffs. Chris Davis and Manny Machado are both chasing historic records; Davis the single-season home run mark, and Machado the record for most two-baggers in a season. This team is fun to watch, but the pitching must improve in the second half. 12. Arizona Diamondbacks (3) - They have an MVP candidate in Paul Goldschmidt and a CY Young candidate in Patrick Corbin. The team is healthy, so why is their record not better? They remind me of the Royals. They can't seem to put it all together on a consistent basis. The lineup is ever changing so that Kirk Gibson can keep everyone happy and hot. We'll see if that strategy can hold off the surging Dodgers. 13. Los Angeles Dodgers (26) - My choice at the beginning of the season to win the National League West is finally coming to fruition. 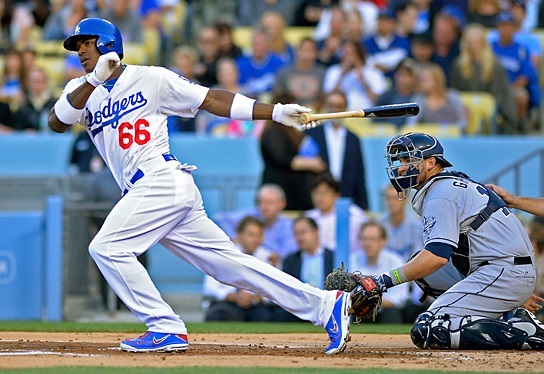 Yasiel Puig is right at home in the bright lights and Hollywood scene in Los Angeles. The pitching is beginning to do what it is supposed to, and the addition of Ricky Nolasco will be one of the biggest additions not talked about around the league. He is a great No. 2 starter, and since he is actually their No. 3, that works out all the better. In the end, Adrian Gonzalez is going to be the main reason this team wins the division. He's my choice for biggest All-Star snub in the NL. 14. New York Yankees (5) - The Yankees are 6-games over .500, and are winning with what is essentially their B-squad as far as position players go. They have guys named Almonte, Cruz and Overbay manning the field. Pitching has remained a positive, with Sabathia, Kuroda and Rivera continuing to perform well. Robinson Cano is putting up great numbers with little-to-no protection in the lineup. Derek Jeter came back for a couple of hours only to land right back on the disabled list. If these guys are still in the playoff hunt come September, Joe Girardi has to be Manager of the Year, even over John Farrell. 15. Philadelphia Phillies (18) - With the Braves dealing with some injuries, if the Phillies are going to get back in the playoff race, now is the time. Domonic Brown is putting up big numbers; 24 home runs and 69 RBI. Michael Young is still being shopped around. Cole Hamels needs to figure out a way to earn that $153 million contract, because 4-12 with a 4.16 ERA is just flat out pathetic. 16. Washington Nationals (13) - These guys are tied with the Angels for the biggest disappointment in baseball. They have had injuries, but their pitchers have been pretty healthy for the most part. Bryce Harper and Ryan Zimmerman have to stay on the field if they are to have any legitimate chance at making a late season push for the NL East crown. The call-up of Anthony Rendon has proved to be a nice move, as he is hitting .280 with 4 home runs and 14 RBI through 47 games. 17. Toronto Blue Jays (25) - They are playing in the toughest division in baseball, and with all the pitching additions, have a starter ERA of 5.07. That's just atrocious. Is it time for them to deal Josh Johnson and Ricky Romero, or do they stay the course and hope to catch fire again like they did in June? Time will tell. 18. Los Angeles Angels (27) - While Mike Trout is putting up solid numbers (.323/16 HR/61 RBI), guys like Josh Hamilton, Albert Pujols and C.J. Wilson haven't carried their fair share of the weight. Howie Kendrick has put together a nice season (.308/11 HR/41 RBI), so now they are going to have to pay him. Good luck with that, Mr. Moreno. Angels are coming up in the world, but the teams ahead of them just appear to be better. 19. San Francisco Giants (8) - Pitching used to be their strong suit, now it's a weakness. They are 20th in the league in earned run average, and Matt Cain has lost more velocity than I have weight; which isn't a good thing for either of us. Brian Sabean needs to decide whether to stay put or start making some moves. At least they'll be getting out of Barry Zito's deal this offseason. He won't trigger his $18 million option for 2014 because he's coming up way short of the 200-IP clause, and that means the Giants can buy him out for $7M. 20. Colorado Rockies (15) - They started hot out of the gates, but suspect pitching has caused a decline in the Mile High City. I mean, they signed Roy Oswalt for crying out loud. That says it all right there. They have a tremendous young lineup, but are lacking the pitching needed to really compete for a division crown. I don't see them being sellers at the deadline, but they may not do much buying, either. 21. Kansas City Royals (17) - The Royals are a headache to follow. They pitch well and can't score one day, then they score and can't pitch the next. It's a vicious cycle. They have a ton of pieces to have a really good team, but that feared hitter that goes out and drives in 100 and hits 40 homers just isn't there. Hopefully Dayton Moore locks up Ervin Santana, or if nothing else, sees this as an opportunity to get something for him. 22. Milwaukee Brewers (24) - I know they currently trail the Cubs in the division, but I see so much in Carlos Gomez and Jean Segura. Those two will make the middle of that lineup solid for years to come. I believe the biggest problem with this team is the way the bullpen has been handled. K-Rod, Henderson and Axford should have been more than enough to shut down the 7-9 innings, but the right mixture was never put together. Now Rodriguez is in Baltimore. 23. Chicago Cubs (22) - The Cubs are getting rid of what they can and stockpiling international signing money. What that does is increase the amount of money they can use to sign international players. Matt Garza was dealt to the Rangers, and Alfonso Soriano will probably soon follow him out the door. I can't wait to see what Theo Epstein and Jed Hoyer do moving forward. 24. Seattle Mariners (20) - It's Felix Hernandez, Hisashi Iwakuma, and pray for rain in Seattle. Raul Ibanez has found the fountain of youth apparently, and is on pace for more home runs than any 40-year-old to play the game. But therein lies the problem; their top hitter is over-the-hill. Remember the names Nick Franklin and Kyle Seager. They'll be well-known shortly. 25. New York Mets (28) - They have some guys that could be moved at the deadline, but what they should do is shop their franchise player. With the pitching coming around nicely in Cy Young candidate Matt Harvey and Zack Wheeler, if they deal David Wright for some pieces, they could get better a lot faster than if they continue to pay on his contract. 26. San Diego Padres (19) - The injury bug has hit Buddy Black's team hard, and they just can't seem to put it together. However, the National League West is weak this season, so don't count out anyone in the division just yet. Jedd Gyorko is a bright spot for the future. 27. Chicago White Sox (21) - The bidding will begin for Alex Rios. Ken Williams has made it clear that if your name isn't Konerko or Sale, you're available. Rios, Dunn, Ramirez, Peavy, and everyone else for that matter, is on the market. Enjoy the rest of the season, Sox fans. 28. Minnesota Twins (23) - "Fire Ron Gardenhire" is all I'm hearing when anyone talks about the Twins. He had nothing to do with them trading for Vance Worley when he was injured. It's not his fault Aaron Hicks is barely hitting his own weight, either. I know Joe Mauer is the face of the franchise and all, but imagine what they could get in return for him in this weak trade market. Just a thought. 29. Miami Marlins (30) - The Marlins just went 37 innings without scoring a single run. 37 innings. What more needs to be said here? 30. Houston Astros (29) - It doesn't look like the new uniforms are providing any type of magical voodoo, as the boys in Space City are looking up at everyone else in Major League Baseball. Hey, there's always next year. That concludes our second power rankings for the 2013 season. Hope you enjoyed it. Our next rankings will go up around the third week of August. Pretty good list. Not sure I would have put the Indians in the top 10 but for the most part I agree with it. Not bad David. I personally wouldn't have put the A's at number 1, but they're certainly worthy of the top 5. There's a few others that I would change a little bit, but nothing so outlandishly wrong that I would make a big fuss over where you have them. Oakland isn't the best team in baseball. Baltimore is ranked too low. These rankings are a joke. What Will Peyton's Lasting Legacy Ultimately Be? Who's Afraid of the Loud Angry Black Man? Copyright © 2018 The Bleacher Briefings, Inc. All Rights Reserved. Powered by Blogger.